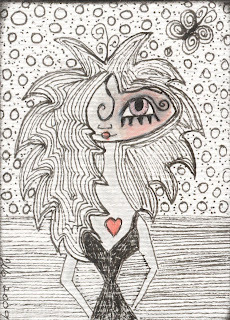 Stripes and polka dots...I've tried to to it with a black pen, this is one of my whimsy gothic galz. what a great and fantastic zentagle piece!!! WhaT a fun piece! Thanks for sharing your talents. Such a fun piece. Pen and ink is a great medium. Oh wow I lurve your style and this is fantastic. WOW Joan, so original and wonderful!!! How fun! She's a cutie!